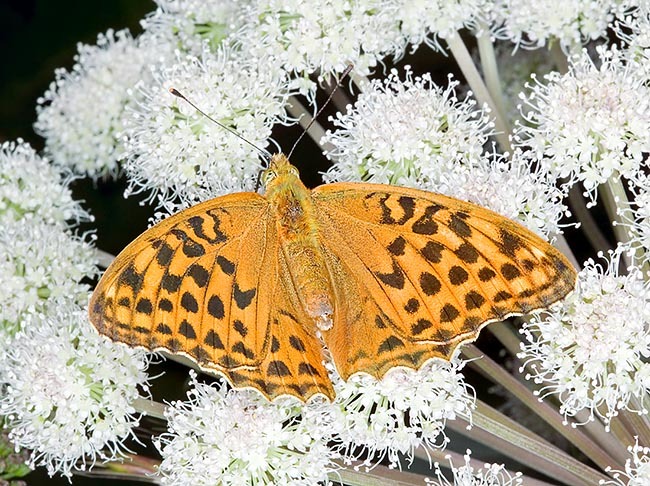 The Silver-washed fritillary (Argynnis paphia Linnaeus, 1758), belongs to the order of the Lepidoptera and to the family of the Nymphalidae. In this family are usually included more than 6.000 species of butterflies scattered all over the world, and consequently it is deemed to be the most consistent amongst those grouping the diurnal lepidopterans. The fast and elegant flight, the golden colour of the wings, the silvery reflections in the lower page, the ubiquity of this species, have, since always, connected this butterfly to the beauty of Aphrodite (Venus). The etymology of the scientific name of the Argynnis paphia has maintained this characteristic in its binomen. Argynnis was a very beautiful woman loved by Agamemnon who, in order to remember her upon her demise, erected a temple in her honour, a place which later on became a destination for the pilgrims going to worship Aphrodite (Venus). 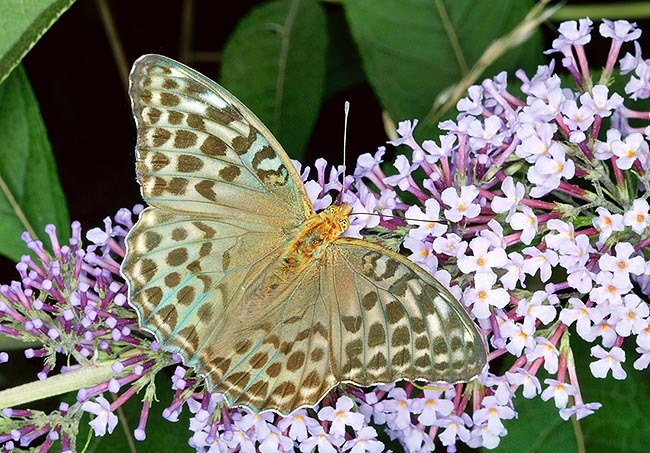 In such way, the name of Argynnis was connected to the goddess of beauty. “Paphia” is the feminine version of “Paphos”, an old city placed on the western coast of Cyprus where it was thought that Venus had come to life getting off from the waves of the sea. This site was one of the most important places for the worship of the goddess of beauty. Finally, Fabricius, 1807, an often very imaginative author while rereading the scientific names given by his teacher Linnaeus, appears having wanted to derivate the term “argynnis” from the Greek etymon “arguros – silver”, with reference to the pearly reflections this butterfly has on the back side of the rear wing. 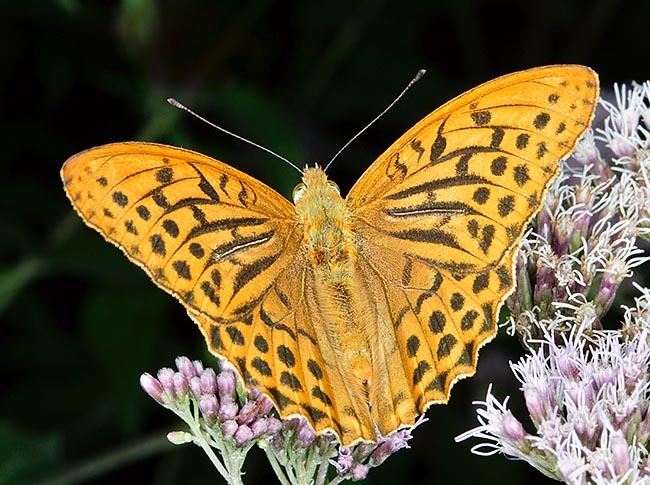 The European common names are rather different but all of them give an indication of elegance to this nice and coloured butterfly: in English Silver-washed fritillary; in French Tabac d’Espagne; in German Kaisermantel; in Dutch Kaizersmantel; in Spanish Nacarada; in Russian Perlamutrovka. 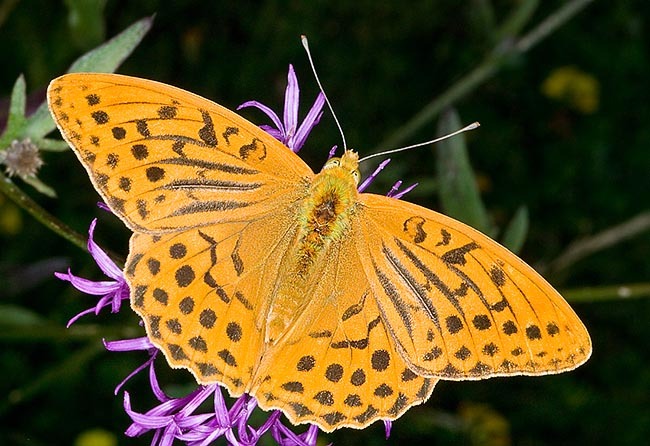 The silver-washed fritillary stands among the most diffused European butterflies reaching the 63° N parallel even if absent in southern Spain and in the Crete Island. Eastwards, it occupies the whole temperate Asian belt reaching the Japan. It is also found in North Africa, but limiting its presence along the whole Mediterranean coast. The silver-washed fritillary nourishes of the nectar of many species of flowers and can therefore spread in various types of habitats. It is present from the sea level up to more than 1.000 metres of altitude, finding its ideal habitat between the 300 and the 800 m, where its concentration becomes even high. It prefers the margins of the woods, the grassy hills and the sunny meadowlands in cool and bushy valleys. The Argynnis paphia is a butterfly with a remarkable wingspan reaching even the 75 mm and is the biggest among all fritillaries. It has bright orange/golden colours on the fore face of the wings, with blackish dotting and stripes interspersed by perfectly round black spots and variously sized lunettes surrounding the borders of both wings. On the back of the fore wing are proposed more or less evident black drawings, on less intense orange background, whilst on the back of the lower wing the drawings disappear replaced by well defined and bright silver whitish/greenish spots and belts crowning also the margin of the same wing. And from these last characteristics comes the common name of silvery fritillary. There is an evident dimorphism between the two genera, as the male shows in an extremely evident way on the upper face of the fore wing, some blackish stripes running almost totally along the length of the wing whilst the same are completely absent in the female. These sexual marks running exactly on the venulae are quite evident and form thick and very prominent stripes. Conversely, the female has small and well defined round blackish spots. In some locations, two different forms of females overlap: the traditional one, just described, and the valesina – Esp. form, where the orange colour is totally replaced by a pearly greenish. The low faces of this form are wholly covered by pearly whitish/greenish scales. It seems that the male prefers to copulate with the traditional form when both forms are available, but does not absolutely disdain thef. valesina. The antennae are well developed and robust, of brown colour, with flattened and rounded vertex. It flies from June up to late September. The Buddleja, Aster, Zinnia, Rubus stand among the preferred flowers, but there is no flower ignored by it. Where it is frequent, it can be often found in great number on the inflorescences of Anethum and Phoeniculum. It has fast movements and strong flight which can be suddenly interrupted as soon as it sees a flower to its liking. Very lively butterfly but also very easy to approach and to observe when feeding. It is a monovoltine species. Oddly enough, it does not spawn directly on the leaves of the host plant, but in a nearby location where the larvae stay till the following spring. The caterpillars are born in September and hibernate very small often still partially wrapped by the shell of their eggs. Once well developed, they show a very attractive and showy colour: on the blackish blue body runs a yellow band spaced by very thin black lines. The sides are dotted by yellow spots and finally the first segment of the body is covered by very long dark yellow spines. A real colour palette. The spring growth is gradual and steady and after about four weeks the larvae pupate, far away from the host plant, for a metamorphosis lasting about 15/20 days. Argynnis immaculata Bellier, 1862; Papilio valesina Esper, 1798.